Ortonville is built on the east hillside of the southern end of Big Stone Lake, above the mouth of the Minnesota River. 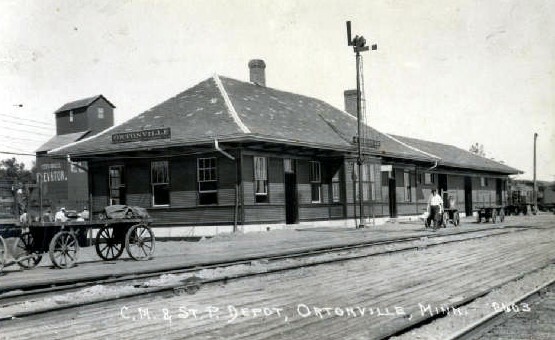 Ortonville was first laid out by its proprietor, C. K. Orton, as early as 1872, the survey being made in September with the help of Alfred Johnson. The plat on file at the Big Stone County Courthouse on page 17 is signed by C. K. Orton and Augusta M. Orton and acknowledged July 31, 1876, by C. K. Orton, before A. J. Parker, Notary Public. Cornelius Knut Orton was born October 11, 1846, in Dane County, Wisconsin. June 1, 1869, at LaCrosse, Wisconsin, he married Augusta M. Westling, who was born in Sweden November 9, 1851. Cornelius Knute was engaged as a bookkeeper in Lanesboro, Minnesota, for several years and was one of the pioneer settlers of that town. He conducted a general merchandise establishment there until he sold his business and came to Big Stone County. In 1871, he arrived at Benson by train and then started out on foot to find a suitable place to settle. At nighfall, he came to the Ole Bolsta cabin on Artichoke Lake, where he spent th enight. The next morning he continued his westward trek. When he reached the hills overlooking Big Stone Lake, he knew he had found just the place he wanted. His formal claim to 160 acres of pre-empted government land was made at Litchfield, the nearest land office. C. K. Orton settled on section nine of Township 121, range 46, in the summer of 1872. He and three of his brothers came with two covered wagons, several head to horses, cows and other livestock, following the Minnesota River to the foot of Big Stone Lake. The Ortons built three buildings near the lake and started farming. C. K. Orton also opened a trading post; most of his customers were Indians. All the building materials were hauled by wagon some 50 miles from Benson and Morris. Supplies were also transported the hard way, by wagon, for the first six years, and produce was marketed at Morris. The post office in Ortonville was established in the fall of 1875, with C. K. Orton the first postmaster. The first marriage in the county was that of Jacob Church to Mary A. Goodwin. Vows were said before W. R. Movius in the summer of 1873. 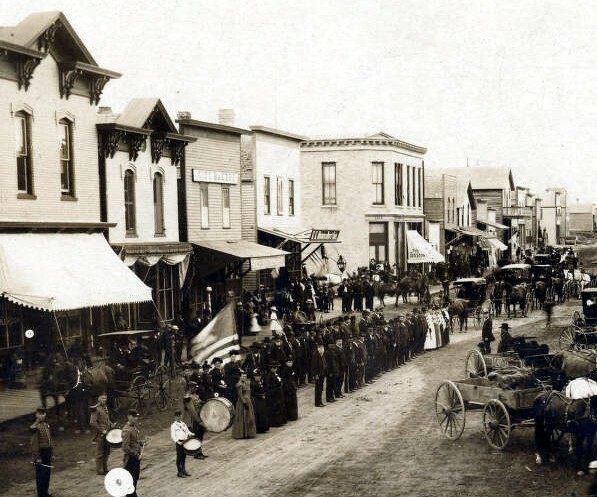 Ortonville was organized as a village by an act of the state legislature in the spring session of 1881. The first permanent store opened in 1876, with Schumaker and Woodly as proprietors. From then on, new businessmen began to arrive and put up buildings, until quite an extensive village had spring up. On Sunday, April 20, 1879, a terrible fire swept across the bottoms, driven from the Dakota prairie by a strong wind. 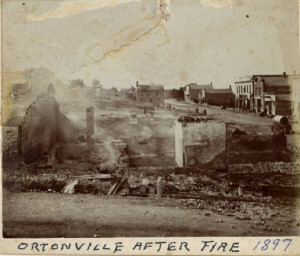 In spite of the efforts of Ortonville’s citizens, the fire almost totally destroyed the village. There were 28 buildings in town; the fire destroyed more than half of them. When it was all over, the only place left standing were three saloons, a hotel, the printing office, the meat market, the blacksmith shop, and the wagon shop. Undaunted by their misfortune, the people of Ortonville immediately began rebuilding their village. About the first of July 1879, it became generally known that the Hastings and Dakota Railroad had located its line to Ortonville, and people began to come in very rapidly. The first passenger train arrived in Ortonville on November 29, 1879. C. K. Orton gave the right-of-way to the railroad. A depot, water tank, an engine house for two engines, and a spur track to the boat landing were soon built. Van Inwegen and Norrish put up an elevator, with a capacity of 75,000 bushels, along the track. Also in 1879, navigation on Big Stone Lake was promoted and several companies were formed to transport passengers and freight. That year C. K. Orton set aside two acres of land to be used as cemetery. In the fall of 1879, Bundock’s Addition, consisting of 40 acres became part of the village. In 1880, C. K. Orton made an addition of 50 acres. In 1879, the smallest homestead in the county belonged to Mrs. Orton. It consisted of three acres, along the lake, a half-mile north of Ortonville. When C. K. Orton died on December 24, 1890, at the age of 44, his widow, Augusta M. Orton, became his sole heir. She found herself with a considerable, but very heavily encumbered estate. Without any previous business experience, she undertook the task of saving the estate. 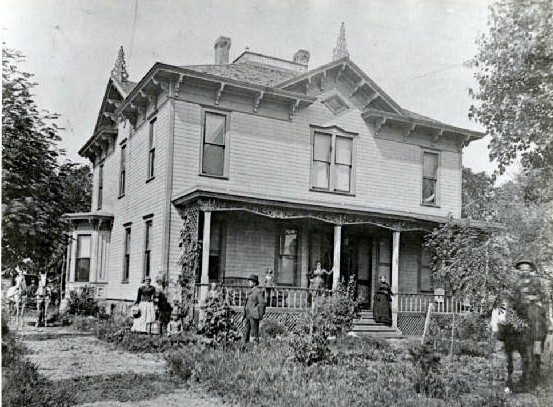 After her death in 1914, her son, Clark W. Orton enlarged the family home into a hotel. The Orton Hotel was torn down in 1970 and replaced with the senior citizen apartment building. August 19, 1897, a small boy playing with matches started a fire that destroyed the entire east side of Second Street between Madison and Monroe, ten buildings in all. February 8, 1898, the City of Ortonville opened bids for $15,000 bonds for its water and light department. The 1899 Plat Book shows the City Water and Electric Works on the lake shore. The Big Stone County Courthouse, constructed of brick and granite, was built in 1902. Hasslen Construction Company is Ortonville’s oldest business that has continued in one family, with descendants of an original founder actively carrying on the name and the original business. Street lights “went on” in Ortonville on Saturday night, June 30, 1917. The Armory was built in 1924 – the Electric Maid Bakery opened, and Red Owl came to Ortonville that year, J. C. Penny Company, opened a store in 1927, and Lundberg Construction Company began building in 1928. Twenty-three blocks of city pavement were laid in the summer and early fall of 1930. A three-day pavement Celebration and Goodwill Festival began with a dedication ceremony on Friday noon, October 10. The Carlson and Hasslen Construction Company was awarded the $37,465 contract for the sewage and disposal plant in 1933. On September 12, 1933, residents of Ortonville voted to permit liquor licenses to be issued. The saloons had closed when the county went “dry” on June 30, 1915. Depression days were not noted for the start of many businesses, but the Cash Town Fruit Store opened in 1931 because Clark Sealey’s truck broke down in “Cashtown.” After selling his load, Clark decided to stay. The area was called “Cashtown” because cash was required for every purchase, while merchants “uptown” carried charge accounts. Peterson’s Ben Franklin store opened in 1933, the year the new Ford V8 came out. The Ortonville Airport was officially dedicated and named Martinson Field in honor of Ed Martinson, on Sunday, June 9, 1974.